If you experience a manufacturing defect in materials or workmanship Custom Sash warrants your stole for the lifetime of the product, and we will repair or replace the product at no charge. Custom Sash has sole discretion to determine manufacturer's defects. Please email info@customsash.com with your order number or proof of purchase along with detailed photographs of the defective product. Measurements are shown on the image to the left. Sash width is 5" in all areas. Measurements were taken on a person who is 5'8" tall, however our sashes are a one size fits all cut. We have developed the perfect universal sash size to fit you perfectly no matter how tall, short, wide or skinny! 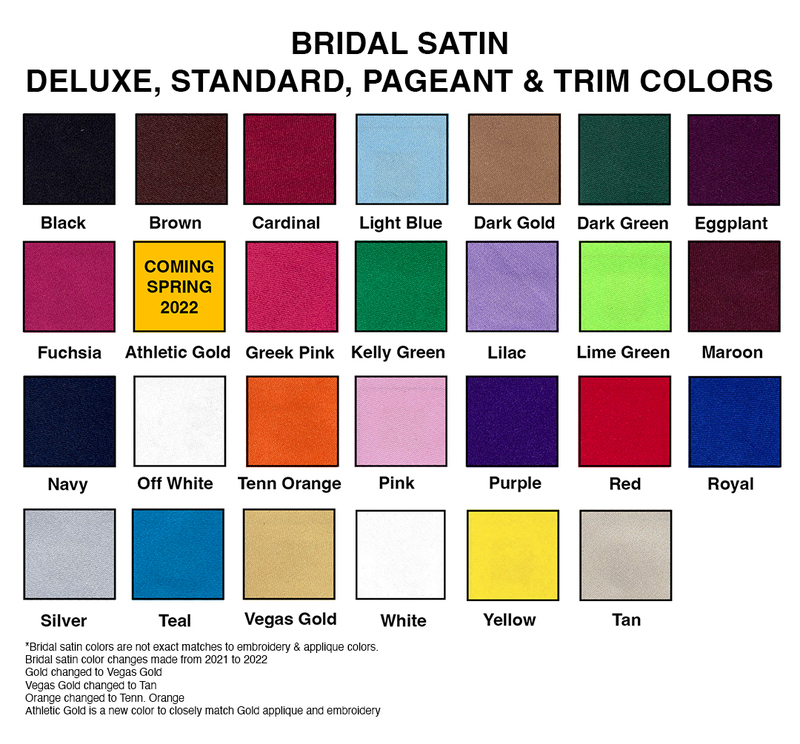 This is our most basic sash, an economical approach to looking great on your special day! 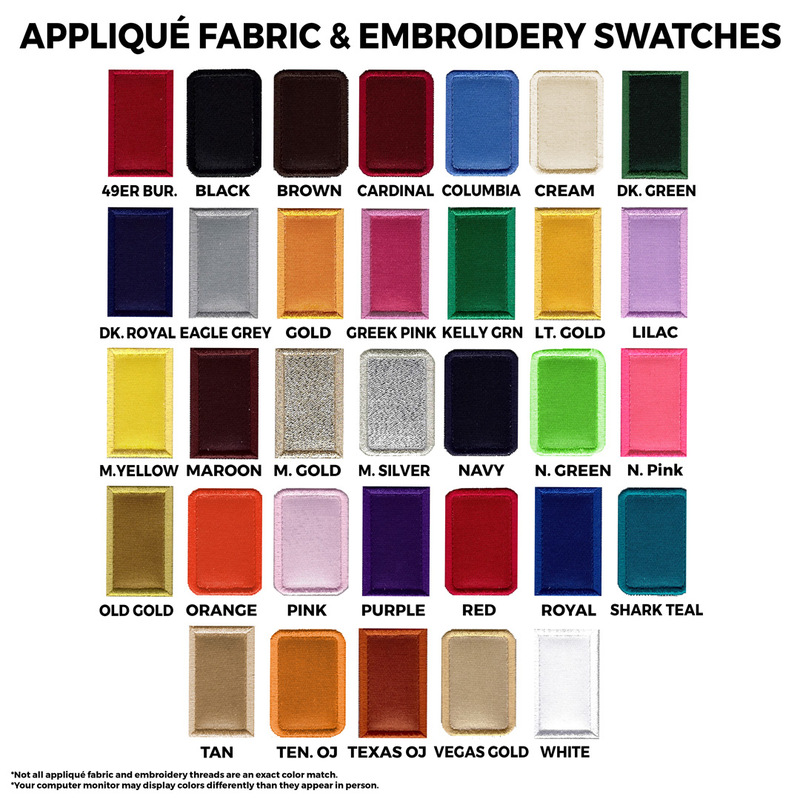 All sashes are embroidered and made to last, we do not use patches, printing or any other type of embellishment. This is our most popular sash, it features a ribbon trim to give your sash a very luxurious look. If you want to stand out, the deluxe sash is the way to go! Measurements are shown on the image to the left. Sash width is 4" in all areas. 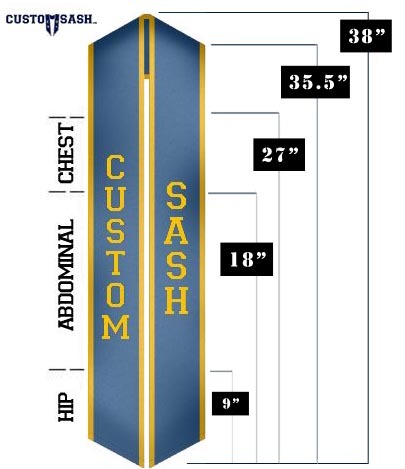 Measurements were taken on a person who is 5'8" tall, however our sashes are a one size fits all cut. We have developed the perfect universal sash size to fit you perfectly no matter how tall, short, wide or skinny! This sash drapes around your shoulder and is sewn together at the end, no more pesky bobby pins! This sash can be designed to drape from left to right or right to left. Due to the high level of customization, this sash is only available for large group order (over 40 pcs). Contact us to receive a quote! How long does it take for my sash to be ready? Make sure to take into account 2 separate time frames when ordering. Standard Production can take UP to 2-3 weeks, it can also be done sooner, however there is no guarantee. RUSH PRODUCTION TIMES ARE GUARANTEED. If you are cutting it close, don't worry, you will get to enter your event date on the last page of checkout. If there are ANY issues in regards to the production method or shipping method you selected, we will contact you immediately. Standard production time can be up to 2-3 weeks. We also offer 1 day, 3 day 5 day and 8 day production(see below). Make sure to account for shipping time when ordering. 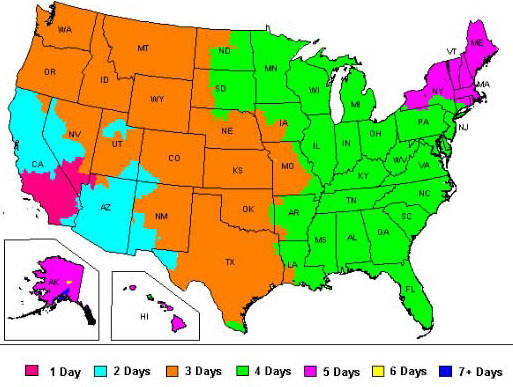 We offer shipping options that range from 5-8 business days(free shipping) to overnight service. If you are cutting it close, be sure to write your event date so that we may notify you of any potential issues(you can write your event date on the final screen of the checkout process). Our production team will take into account all of your order details to make sure you get your sash as soon as possible. For instance if you have selected standard production, but overnight shipping. The production department may decide to upgrade your production and ship by a slower method as long as the end result is getting the sash to you more quickly. 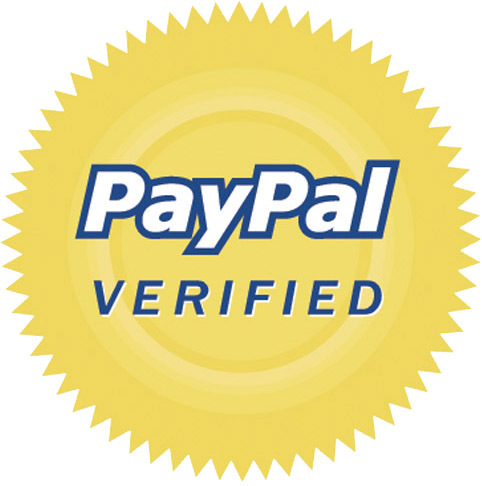 If we feel that your order may need to be shipped by an expedited method which you have not yet payed for, you will be contacted. Likewise, if the production method you selected is not sufficient you will be contacted as well. My graduation/event is coming up soon and I need my order FAST! *These options can be selected under the preview screen in the design lab, Standard Production(2-3 weeks) is selected as the default production time. Standard production CAN be faster but there is no guarantee! I want to talk to someone before I order! How can I save my design and come back to it later? Then bookmark the link of the following page that says "Review Design & Checkout"
If I place something on the right side which side will it be on when I wear it? When designing your sash, imaging you are designing it on on another person while they are wearing the sash. If you place a design element on the right side of the sash in the design lab, it will be on your left side when you wear it yourself. On the image of the sash I designed the text sticks outside the lines; will it be cut off on my sash? If text or images on the sash design lab stick out of the boundaries of the sash do not worry; we will size it down to fit onto the sash. Your text or image will NOT be cut off. We will also make sure to align items that are placed across from each-other on opposite sides of the sash. 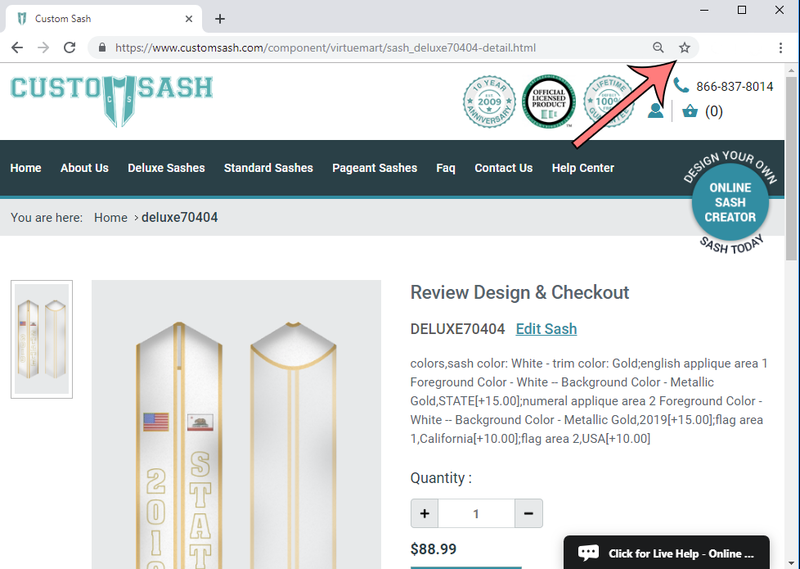 Your website is awesome, but I still can’t figure out how to design my sash. Is there an easier way to do this? Check our Help Center out, we have a full tutorial on how to use the Design Lab. If you still cant figure it out, it’s OK, we understand some may not be used to all this online/techy stuff. Send an email to info@customsash.com and simply describe what you want. One of our customer service reps will create a mock design for you and email it back to you! I want to order for a group. Do you guys offer any discounts for larger quantities? Yes we do. Here is the breakdown of quantity discounts. Bulk discounts apply only to identical pieces. For example if you are ordering 4 Sashes with the name "Jeff" on them and 4 sashes with the name "Mike" on them, your order will not qualify for quantity discounts. You can have one set of sashes that does qualify for quantity discounts and one that does not. For example you can have an order of 8 sashes with the name "Joe" on them and 4 sashes with the name "Lauren" on them. The 8 pieces with "Joe" will qualify for discounts under the 6-9 quantity bracket. The 4 pieces with "Lauren" on them will be priced regularly. Quantity discounts are automatically applied to your order. 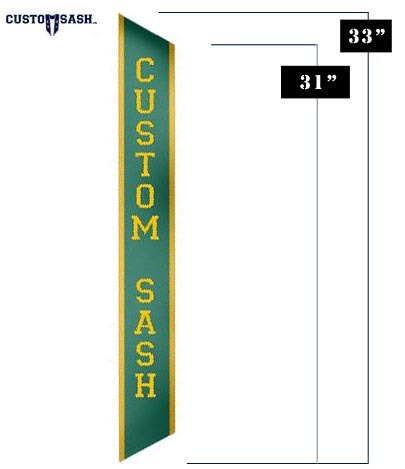 A price breakdown is available under the preview of the sash in the design lab. 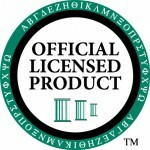 My organization ordered sashes from you before and we just want the same thing. Provide us with the email address(or previous order number) from which the order was previously placed so that we may look it up. If you cannot find the email, send us picture of an existing sash and we will match it for you. You can send us an actual picture of last years graduates wearing the sash or the proof from the previous years order. We are very sorry to hear this, let us make it right! Please email INFO@CUSTOMSASH.COM and a customer service representative will get back to you as soon as possible. Keep in mind you will never be required to pay for shipping for something that was our mistake. Furthermore, we treat any remake order as a top priority, we try to ship the corrected sash out within a few days, with free expedited shipping if necessary. My order came out great! We are glad to hear. Share this with the world on our google business page by writing a review or posting some pictures. We would love to see it. We always love to hear about your graduation stories as well! To find us search Custom Sash on google and look for our business page. I placed my order a while ago and it’s still not here. Remember standard production time can take up to 2-3 weeks. If it has not yet been 2-3 weeks please be patient. If for some reason it has been over 2-3 weeks give us a call or email to yell at us. You can upgrade your production time if necessary, we offer 1 day, 2 day , 3 day, 5 day and 8 day service. 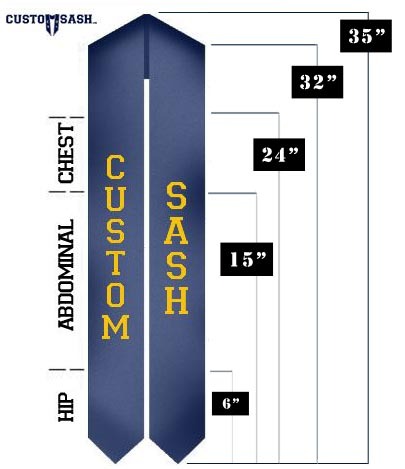 If you need to upgrade production time, please send an email to info@customsash.com; make sure to include your order number. How do I know when my order is done? Send an email right away to info@customsash.com. We will do our best to accommodate your change ifit is not too late. Make sure to include your name and order number. Remember no order changes can be made over the phone OR by live chat. You must send an email from the same address the order was placed under to process a change. Unfortunately you cannot cancel an order after it has gone into production. Since each sash is made to exactly your specifications, once production has begun it cannot simply be restocked or resold. We always do our best to accommodate cancellations because we understand things do come up, so if you feel you may need to cancel your order, please notify us ASAP. How long does shipping take to my location? You may be responsible for local duties, tariffs or taxes. Please check with your local post office regarding these rates. Shipping rates might exceed what is quoted at time of checkout, we will contact you if there are any excess shipping charges.